Teaching Current Directions brings cutting-edge psychological science into the classroom. In January 2018, we celebrated 5 years of using the column to share our passion for teaching psychological science. Its mission endures, but the contents and contributors have evolved. Here we share the column’s history, our reflections on its first 5 years, and our goals for its future. Teaching Current Directions can be traced to a November 20, 2002, email from APS Executive Director Emeritus Alan Kraut to David Myers. Current Directions in Psychological Science was flourishing, and Kraut wondered whether Myers might help him with a pet project. “What we haven’t done is make the more direct connection between the journal and teaching,” Kraut said. “I always thought that what was missing was a section in each issue on how certain articles in that issue might be used in the classroom.” A few emails fluttered between Kraut and Myers in the ensuing year. Nothing solidified and the case went cold. In 2012, two unrelated events led to the birth of Teaching Current Directions. First, Myers recruited Nathan DeWall as successor coauthor on his Introduction to Psychology textbook series. Second, Kraut cleaned out his email inbox, leading him again to invite Myers to write a teaching column that featured Current Directions articles. Now working as a duo, Myers and DeWall enthusiastically agreed to select, summarize, and showcase Current Directions articles in the APS Observer, describing how instructors could bring the science into the classroom through engaging activities. Apart from the convention issue, Teaching Current Directions now appears in each issue of the magazine. We spent the first few months trying to establish the column’s mission, vision, and values, which include writing essays that highlight new psychological science insights for all Observer readers. With support from the Current Directions authors whose work we feature — and whom we invite to fact check and comment on our essays — those early columns covered topics such as desire, happiness, morality, and residential mobility. As we hit our stride, we began to receive feedback from other instructors who had read the column. To our surprise, more and more people were reading the column and using the activities in their classrooms. Even people with reduced teaching loads, who might not have been getting the opportunity to use the activities we described, told us they read the column every time they received the Observer. We had hit a nerve. The column wasn’t free of weaknesses. We struggled to cover topics outside of social psychology, our shared area of expertise. To fill this gap, we recruited two talented cognitive psychologists, APS Fellows Cindi May (College of Charleston) and Gil Einstein (Furman University), who began contributing several coauthored columns each year beginning in 2016. Their expertise and creativity helped add breadth and depth to the topics covered, which increased the column’s impact. Psychological science embraces and celebrates all forms of diversity. To ensure that the column did its due diligence in addressing issues of cultural diversity, we called upon the accomplished cultural psychologist Beth Morling as a contributing columnist in 2018. Morling’s research methods, textbook authorship, and multifaceted experimental and teaching experience enable her to add a unique cultural perspective to the column. The future of Teaching Current Directions is bright. Mariko Hewer and Kimberly Armstrong at APS continue to provide excellent editorial and technical support. This includes establishing an electronic database of all Teaching Current Directions columns. We hope to engage readers further by creating an interactive online feature in which instructors can share their experiences using the activities included in each column. 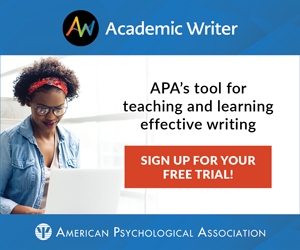 Although both of us plan to continue contributing columns, we also hope to approach other talented teacher–writers who can aid our mission of bringing cutting-edge psychological science into the classroom. The first 5 years of Teaching Current Directions have taught us that people are hungry to learn about psychological science and how to share its insights with others. Whether in a classroom, a conference presentation, or an informal hallway chat, people are eager to teach others how to better understand themselves, their fellows, and their global community. We look forward to touching base with you again in 5 years. Fiske, S. T. (2018). Stereotype content: Warmth and competence endure. Current Directions in Psychological Science, 27, 67–73. What do dogs, Hershey’s chocolate, and middle-class people have in common? What about rats, Goldman Sachs, and teenagers? Despite their disparate categories, each triad has a similar “feel” to it. I would guess you feel pretty good about the first triad, but a bit icky about the second. Now consider this triad: hamsters, the United States Postal Service, and the disabled. Do you feel ambivalent about these seemingly pitiful groups? Warmth addresses a group’s intent: Are they sociable, trustworthy, and cooperative, or cool, untrustworthy, and competitive? Competence addresses a group’s capability and effectiveness: Can they act on that intent, or can a person safely ignore them because they present no threat? 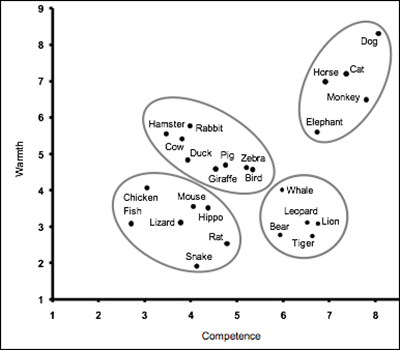 The SCM argues that warmth and competence dimensions convey evolutionarily functional information. Stereotype content research captures what “everybody knows” about the groups in their community. People’s ratings populate four quadrants of a two-dimensional space, with in-groups (e.g., Christians, Whites) rated as both warm and competent and out-groups (e.g., drug addicts, teenagers) seen as neither. There are also two ambivalent quadrants. Some groups are perceived to be competent but cold (e.g., rich people, professionals); others are incompetent but warm (e.g., the elderly, disabled). Exposing undergraduates to the SCM introduces key psychological constructs such as stereotyping, ambivalence, and evolutionary reasoning, as well as the quantitative concept of dimensional space. Here’s a way to make the theory come alive in your classroom. First, work with your class to create a big list of groups in the local campus community. List them on the board while a volunteer writes each on its own sticky note. Come prepared to seed the list with groups from each quadrant, such as engineering majors, middle-class students, landlords, professors, honors students, custodial staff, LGBTQ individuals, Lambda Chi Alpha members, and so on. As viewed by people on campus, how competent and efficient are members of this group? As viewed by people on campus, how friendly and trustworthy are members of this group? Announce that you are not interested in students’ personal beliefs, but in how each group is viewed by others. As teams decide their ratings, prepare the chalkboard with two axes: competence (horizontal) and warmth (vertical). Teams will come up and affix each Post-it note to this two-dimensional space. Subsequent questions should first address how the two dimensions have practical utility. Warmth answers the evolutionarily important question, “Are they friend or foe?” Competence answers the equally important “How effective are they?” Human social cognition that focused on these two questions probably assisted survival in the distant past. Second, discuss the four quadrants. 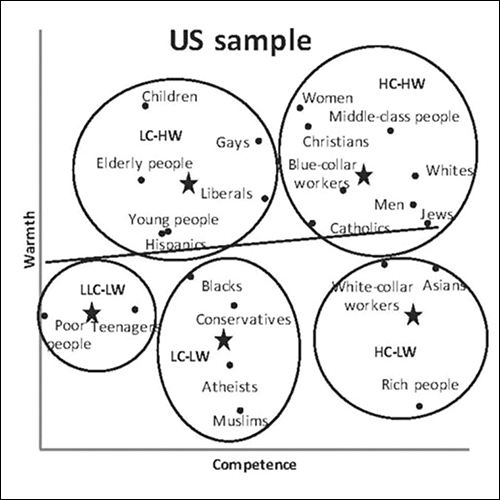 Researchers use cluster analyses to quantify the similarities, but your class map probably includes some “in-groups” (perhaps middle-class students) who are high in both competence and warmth. Look for a low–low quadrant (perhaps local homeless people). Check for off-diagonal, ambivalent quadrants: Groups considered warm but incompetent (football players, perhaps?) or competent but cold (maybe Asian international students?). Explain the concept of ambivalence and how SCM’s two dimensions predict these mixed stereotypes. At this point, some students may take offense at what they see. Now’s the time to remind them that normative stereotypes — conventional wisdom — are not personal beliefs. In fact, even members of stigmatized groups can reliably report what others think of their own category. To lighten the mood, show how US brands and animal subgroups adhere to the warmth/competence space. Finally, describe the emotions that are reliably associated with each quadrant. Typically, people feel admiration for groups in the top right and disgust or contempt for those in the lower left. Ambivalent emotions go with ambivalent quadrants, with pity in the top left and envy in the bottom right. The SCM strengthens our understanding of social cognition by showing how the content of our stereotypes reflects the essential questions we ask about others. Fiske, S. T., Cuddy, A. J. C., Glick, P., & Xu, J. (2002). A model of (often mixed) stereotype content: Competence and warmth respectively follow from perceived status and competition. Journal of Personality and Social Psychology, 82, 878–902. Kervyn, N., Fiske, S. T., & Malone, C. (2012). 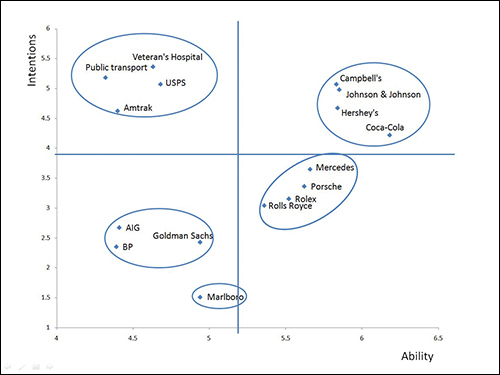 Brands as intentional agents framework: How perceived intentions and ability can map brand perception. Journal of Consumer Psychology, 22, 166–176. Kervyn, N., Fiske, S. T., & Yzerbyt, Y. (2015). Forecasting the primary dimension of social cognition: Symbolic and realistic threats together predict warmth in the stereotype content model. Social Psychology, 46, 36–45. Sevillano, V., & Fiske, S. T. (2016). Warmth and competence in animals. Journal of Applied Social Psychology, 46, 276–293.